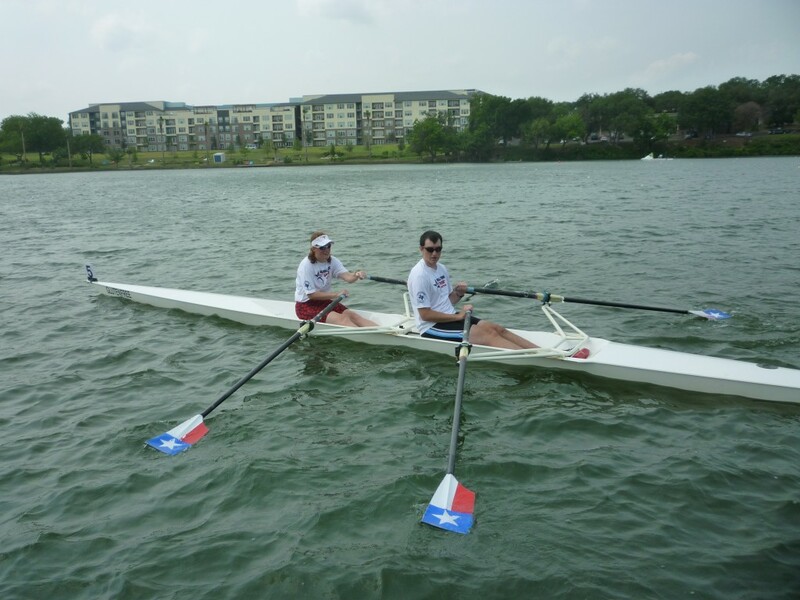 Texas Rowing For All hosted and sponsored the US Rowing National Development ID Camp that was held March 25, 26. 27, 2011 on Lady Bird Lake in Austin. The Camp was targeted to rowers with intellectual disabilities who wanted to increase their skills, technique and try out for the US High Preformance National ID Rowing Team. Rowers from across the United States attended the Camp that was coached by Karen Lewis, National Adaptive Rowing Team Coach. Athletes were also under the direction of Debbie McDiarmid, Head Coach of the TRFA ID team. The weather during the Adaptive Camp was clear and sunny, in the 80′s every day with minimal wind…water condition perfect! Friday, Day 1 included 2 (morning & afternoon) on-water coached sessions. Athletes rowed sweep 8+ incorpating drills, steady state and teamwork. After the first session, the athletes & coaches breaked to enjoy a delicious lunch sponsored by Poke-Jo’s BBQ. During the lunch rest break athletes engaged in fun team-building games playing “minute-2-win it”, then it was time to be back on the water for the afternoon rowing session. Friday night’s highlight was an Athlete-Coach dinner at Canolli Joe’s resturant. Saturday’s session brought on 2 more on-water coached rowing in the morning & afternoon. Athlete’s swept in 8+ working on seat arrangement, rowing in syncronicity, engaging in on-water drills, steady state and a few race pieces. After a hearty lunch, cupcakes were in order to celebrate the birthday of one of the athletes. Saturday evening, a “Meet & Greet” party was held & hosted by the Texas Rowing For All’s Board of Directors. The buffet was held poolside at Maria Shelton’s lovely downtown condo. Athletes, family members; sponsors; and the TRFA Board of Directors gathered, and a good time was held by all. Sunday morning, the athletes gathered at Fly Wheel Fitness on South Lamar Blvd for a morning ergometer session, coached by Karen Lewis. Debbie McDiarmid, Karen Lewis, Terry Smythe, Edie Diesler, Kelly Coulter, Diane McDiarmid, Randy Rosens , Vincent Perez, Maureen Fitzgerald, David Miller and all our athlete host families.